One good thing about living in this age is instant access to information. What could be better than that? Maps! The USGS has up-to-the-minute maps for earthquakes all over the world. For the latest Virginia events click here. You can find their main earthquake page here. The USGS also has a crowd-sourced program - called Do You Feel It? - where users can gauge the quake at their location and report back to help build the map below. More on that program here. 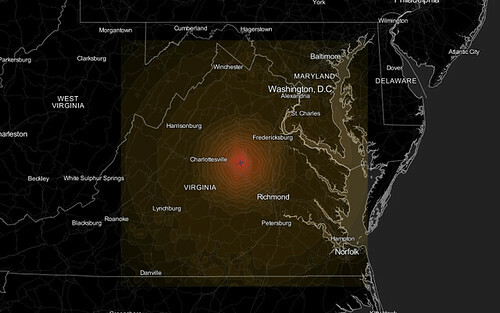 The good people at Development Seed created some cool maps just after the largest Virginia quake using publicly-available data and some tools from the guys at MapBox. Please click here to see how they quickly mashed up the earthquake data to make some great maps. Though, I think the most interesting visualization is this animated one, showing the earth rippling like a pond. Cite this post: Chris Gist. “Mapping the Earthquake”. 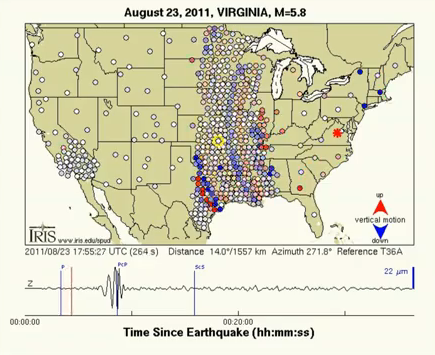 Published August 24, 2011. https://scholarslab.lib.virginia.edu/blog/mapping-the-earthquake/. Accessed on .